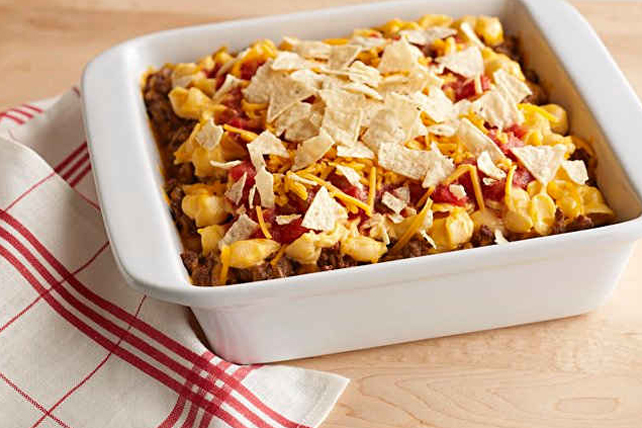 This Cheesy Pasta Nacho Bake is hearty with salsa, sour cream and ground beef—all covered with a topping of cheesy crushed tortilla chips. Prepare Kraft Deluxe Velveeta as directed on package. Meanwhile, cook meat with taco seasoning mix as directed on package. Stir sour cream into prepared Kraft Deluxe Velveeta. Spoon half the Kraft Deluxe Velveeta mixture into 8-inch square baking dish; top with layers of meat mixture, half the shredded cheese and remaining Kraft Deluxe Velveeta mixture. Cover. Bake 15 min. ; top with salsa, remaining cheese and crushed chips. Bake, uncovered, 5 min. Serve with a fresh mixed green salad tossed with your favourite Kraft Dressing.